Friday April 9 1909 It was not quite so cold today. I was completely worn out with being out in the cold so much. There was a dinner at the church but I could not go down. I took my time to the forenoon work. Wrote to Lydia in afternoon and worked one rug Will hard at work all day in the field. 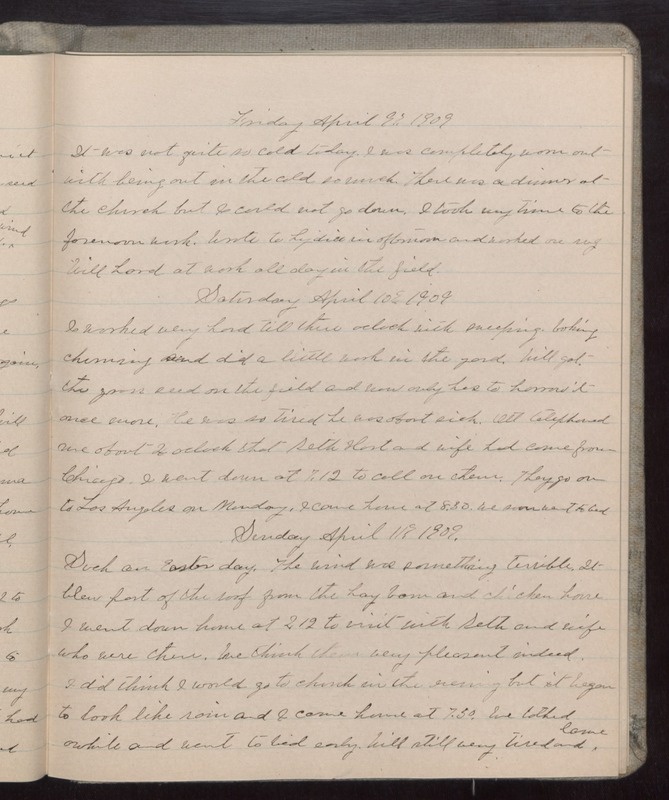 Saturday April 10 1909 I worked very hard till three oclock with sweeping, baking, churning and did a little work in the yard. Will got the grass seed on the field and now only has to [harrow?] it once more. He was so tired he was about sick. Ott telephones me about 2 oclock that Seth [Hart?] and wife had come from Chicago. I went down at 7.12 to call on them. They go on to Los Angeles on Monday. I came home at 8.30. We soon went to bed. Sunday April 11 1909 Such an Easter day. The wind was something terrible. It blew part of the roof from they hay bard and chicken house I went down home at 2.12 to visit with Seth and wife who were there. We think them very pleasant indeed. I did think I would go to church in the evening but it began to look like rain and I came home at 7.50. We talked awhile and went to bed early. Will still very tired and lame.